Artifacts from the Armstrong Family Collection™, which was entirely certified by Collectibles Authentication Guaranty™ (CAG), realized an incredible $5,276,320 at auction, Nov. 1-3, 2018. Armstrong carried this Apollo 1 Gilt Fliteline Medal on the Apollo 11 lunar module. It realized $275,000. The nearly 1,000 CAG-certified items from the collection of astronaut Neil Armstrong — the first man to walk on the moon — and his immediate family members were sold by Heritage Auctions and set numerous records. In fact, the five all-time highest prices realized for space collectibles at Heritage Auctions, a firm that has sold items from the estates of 20 astronauts, are now held by CAG-certified artifacts from the Armstrong Family Collection. "The Armstrong Family Collection represents one of the most important moments in American history, captured by an extraordinary group of artifacts," says Mark Salzberg, CCG chairman and CAG founder. "CAG is extremely honored to have been selected to certify this iconic collection." "CAG significantly simplified the daunting task of preparing the Armstrong Family Collection for presentation to the world. They helped with every step of the process – from inventorying to encapsulation, and they were instrumental in helping us evaluate potential auction houses," says Mark Armstrong, one of Neil Armstrong’s two sons. "We could not be more pleased with the results of CAG’s efforts." "CAG presented a unique opportunity to both preserve and share the Armstrong Family Collection. Thanks to CAG’s efforts, everyone is able to view and study the collection while collectors can acquire a keepsake." The top result was achieved by a Spacecraft Identification Plate flown on Apollo 11’s lunar module during the mission, which lasted from July 16-24, 1969. 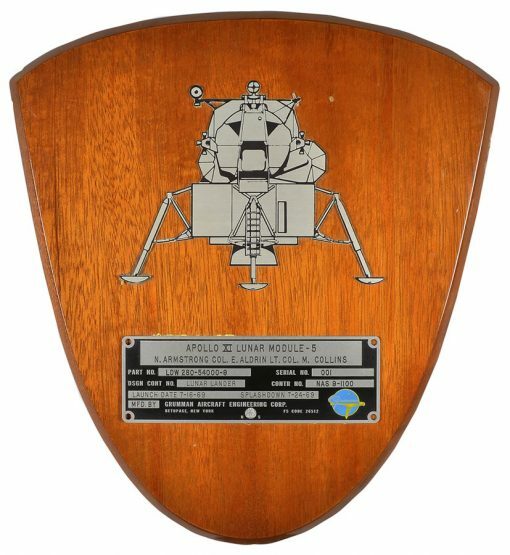 Upon the mission’s return, three lunar module identification plates were sent to its manufacturer, Grumman Aircraft Engineering Corp., and engraved with the mission’s launch and splashdown dates. Each of the three astronauts on the mission — Armstrong, Buzz Aldrin and Michael Collins — was then presented with a lunar module identification plate mounted on a wood plaque. 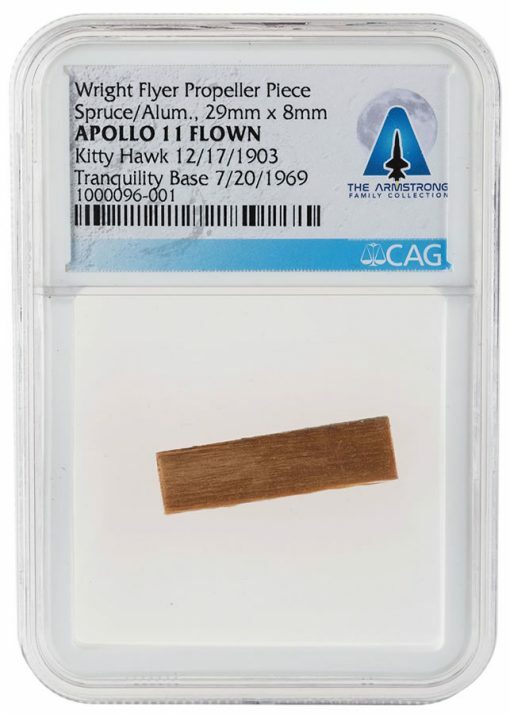 The Armstrong Family Collection sale featured two pieces of spruce from the Wright Flyer’s propeller and four pieces of muslin cloth from its left wing. 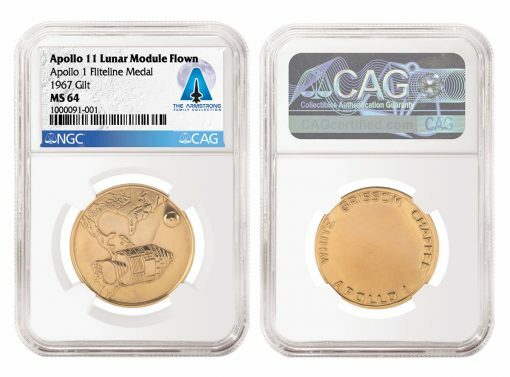 They were certified by CAG and encapsulated in a protective CAG holder with a certification label that bears the dates of the two important events: "Kitty Hawk 12/17/1903" and "Tranquility Base 7/20/1969." Armstrong also carried a variety of flags within him in his PPK on Apollo 11. The PPK allowed for the astronauts to carry mementos on their history-making journey. Flags were a popular item as they were small and light — the PPKs had a weight limit of only half a pound. The largest US flag carried by Armstrong measured 17.75" x 11.5" and was encapsulated by CAG in a flat, tamper-evident holder. It sold for $275,000, a record price for a space flown-flag, as part of the Armstrong Family Collection sale. The Armstrong Family Collection sale also included a number of space and lunar module-flown medals that were certified by CAG and graded by its affiliate, Numismatic Guaranty Corporation® (NGC®), the world’s largest third-party coin grading service. Astronauts in the Gemini and Apollo programs traditionally brought medals with them into space as mementos. These medals, termed Fliteline or Robbins medals depending on the type, were then engraved with the mission dates upon their return to earth. The top result for a medal in the Armstrong Family Collection was the $275,000 paid for an Apollo 1 Gilt Fliteline Medal that Armstrong carried with him on the Apollo 11 lunar module. It is graded NGC MS 64 and encapsulated by CAG in a protective holder. Another significant result for an Armstrong Family Collection medal was achieved by an Apollo 11 Silver Robbins Medal that flew with Armstrong on the mission. Numbered 241, it was graded MS 66 by NGC, certified by CAG and auctioned for a record-shattering $112,500. 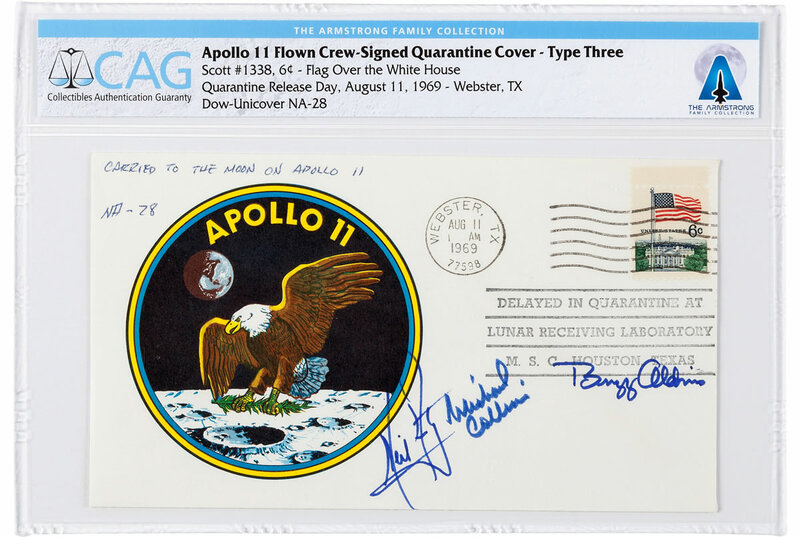 A particularly interesting item sold during the three-day auction was an Apollo 11 Type Three "Quarantine Cover," hand-signed by Armstrong, Aldrin and Collins. This Apollo 11 Type Three “Quarantine Cover” sold for $156,250. It is the highest price ever paid for a space postal cover. "DELAYED IN QUARANTINE AT LUNAR RECEIVING LABORATORY M. S. C. HOUSTON TEXAS." This rare and highly desirable Quarantine Cover was encapsulated in a CAG holder and sold for $156,250 — the highest price ever paid for a space postal cover. "CAG unlocked tremendous value for the Armstrong Family Collection by giving bidders greater confidence in the authenticity and provenance of the artifacts. At the same time, CAG delivered significant long-term value and protection to buyers through its guarantee, impartial assessments and protective holders," says Todd Imhof, Executive Vice President of Heritage Auctions. "Every prestigious estate would similarly benefit from CAG certification." "CAG did a wonderful job expertly describing and, when appropriate, grading and encapsulating the Armstrong Family Collection items. CAG’s certification made it far easier for us to auction the collection and likewise for our clients to evaluate and bid on it."